In the heart of Toronto a very popular attraction that is definitely worth taking some time to explore is Roundhouse Park, home to the John Street Roundhouse. 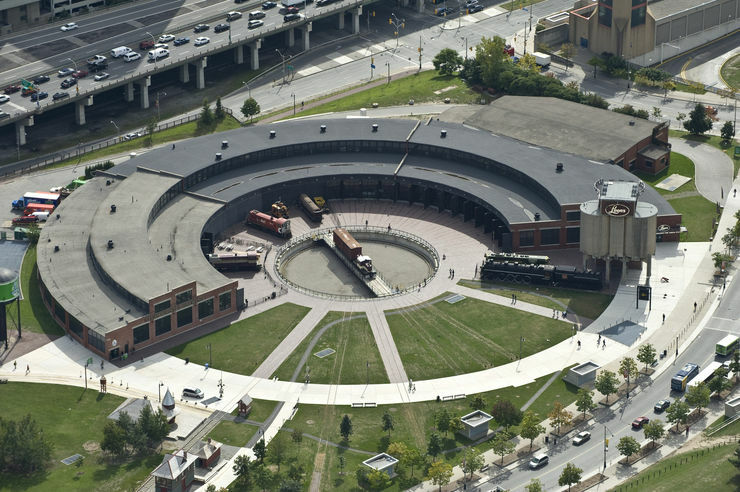 Designated as a National Historic Site of Canada, the Roundhouse was built between 1929 and 1931 and now houses the Toronto Railway Museum, a brewery and a home furnishing store. The park stands on 17 acres of prime city land situated just south of the the base of the CN Tower. 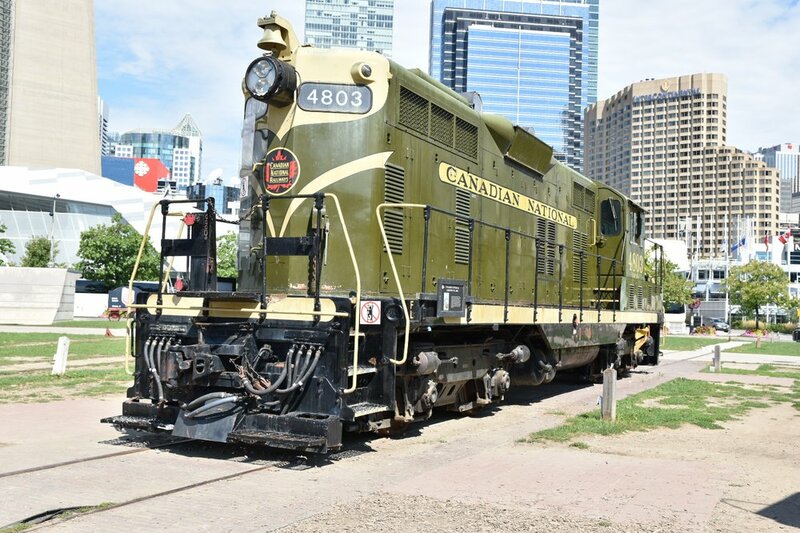 The main focus of the park is the Railway Museum which features many historic locomotives and passenger cars as well as old and restored freight trains. There are signs in all of them explaining the importance of their role in history. This form of transportation emotionally hits the core of many people who remember stories from loved ones of days of old. 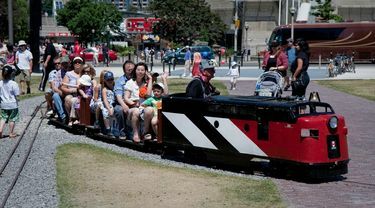 A wonderful, fun and educational feature hosted by the Toronto Railway Museum is the miniature steam railway. 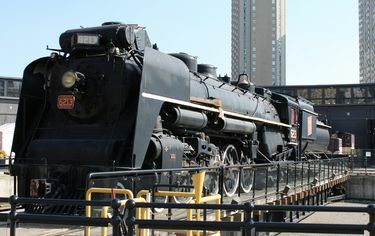 Passengers ride the train and experience a step back in time using real steam technology to run the locomotive. 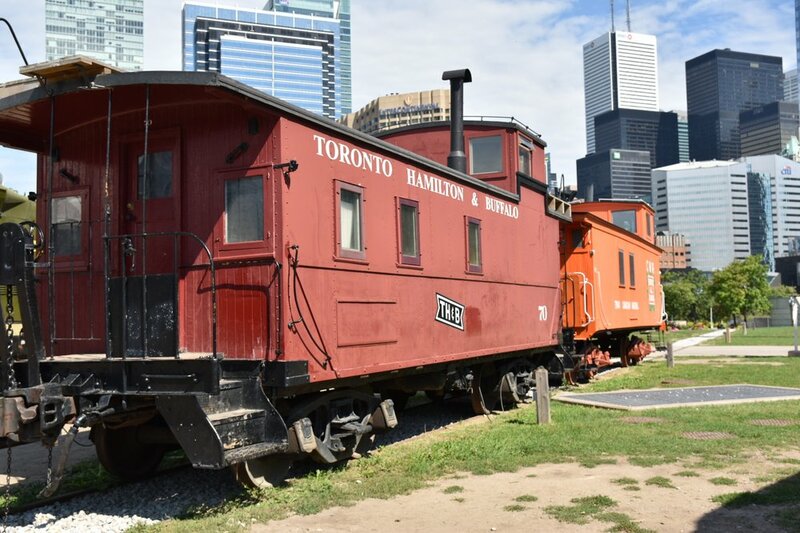 This popular voyage is half a kilometre long starting at the restored 1896 Don Station and passing by many replicas of prominent buildings. 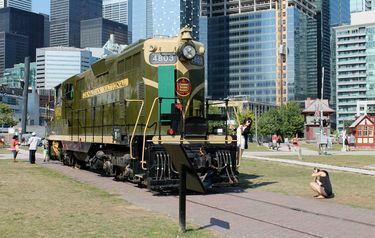 Visitors can also enjoy the sensation of a computer simulated ride situated in an authentic diesel locomotive. Learn about the Canadian origin of the CPR by taking a guided walking tour. There is a small initiation to the steam iron horse, interesting lectures, guide books, a collection of railway equipment and so much more for one to take in and appreciate the fascinating history of this very important form of transportation. 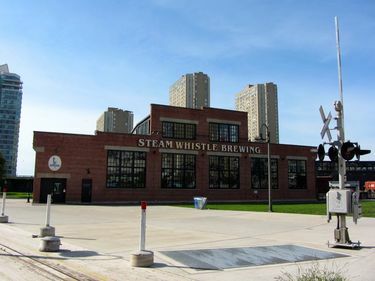 Steam Whistle Brewing is also situated in the charming old John St. Roundhouse that was built in 1929 and used for servicing locomotives from that era until 1986. Here you will be able to take a tour and enjoy tasting samples of this truly Canadian beer. The founders of this company were former workers of the upper Canada Brewing Company and were fired when it was sold to Sleeman and closed down. They decided to put their heads together and open up a brewery of their own. Their pilsner is recognizable by its distinct green bottles that have 3FG embossed on the bottom of them as an inside joke referring to 3 fired guys. All the packaging is made from recycled material. Steam Whistle Brewery is environmentally friendly, having won many awards for this very important aspect. This phenomenal beer is freshly brewed and is GMO-free with only 4 natural ingredients-spring water, malted barley, hops and yeast. Leons furniture occupies the opposite end of the old Roundhouse building from the brewery. Its atmosphere creates a very spacious and roomy showroom making this an enjoyable and grand place to browse or shop for furniture. While visiting the area you might want to take advantage of the new Ripley's Aquarium of Canada which is located right across the street from the park. Fee: The park is free and you can see many of the old locomotives and railcars for free from outside the fence. There is a small entrance fee for access to the Railway Museum which includes the fenced off area. From Union Station follow the SkyWalk west or walk west on the south side of Front Street to York Street or Simcoe Street and go left (south) to Bremner Blvd. Roundhouse Park is right across the street.